After the Muslim conquest of Syria and Iran, the Muslims found it convenient to adopt the administrative and monetary systems of these countries. At first they imitated the Byzantine gold coin type and the Sassanid silver coin type. 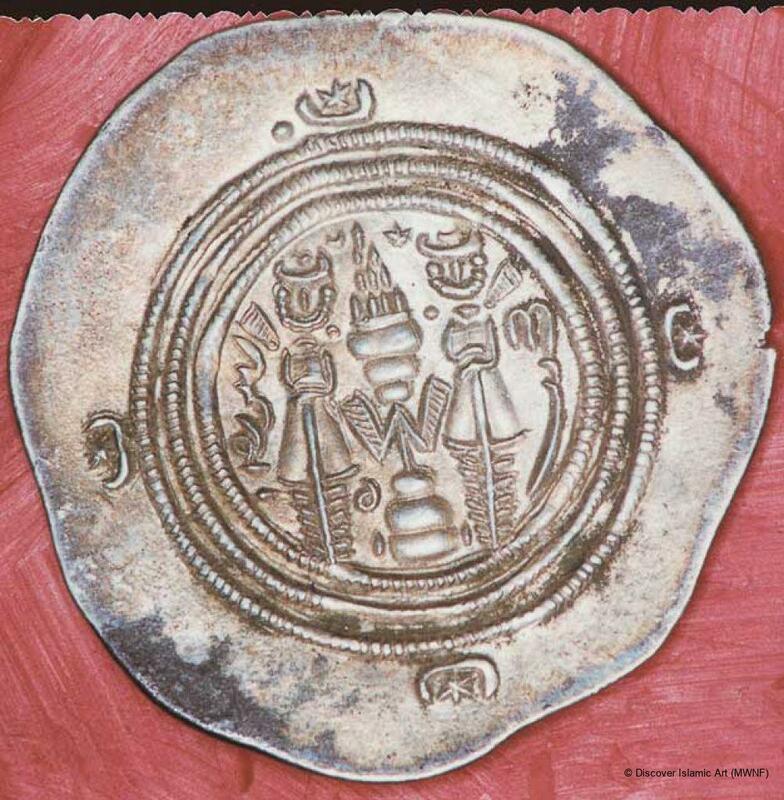 The Arab-Sassanid type which was called Pahlawi (middle Persian) is distinguished by the addition of Arabic legends and the portrait of the Sassanid king on the obverse, and the Zoroastrian fire altar surrounded by two priests on the reverse. The coin seen here is an imitation of a Sassanid dirham struck by Abd al-Malik ibn Marwan (r. AH 65–86 / AD 685–707). 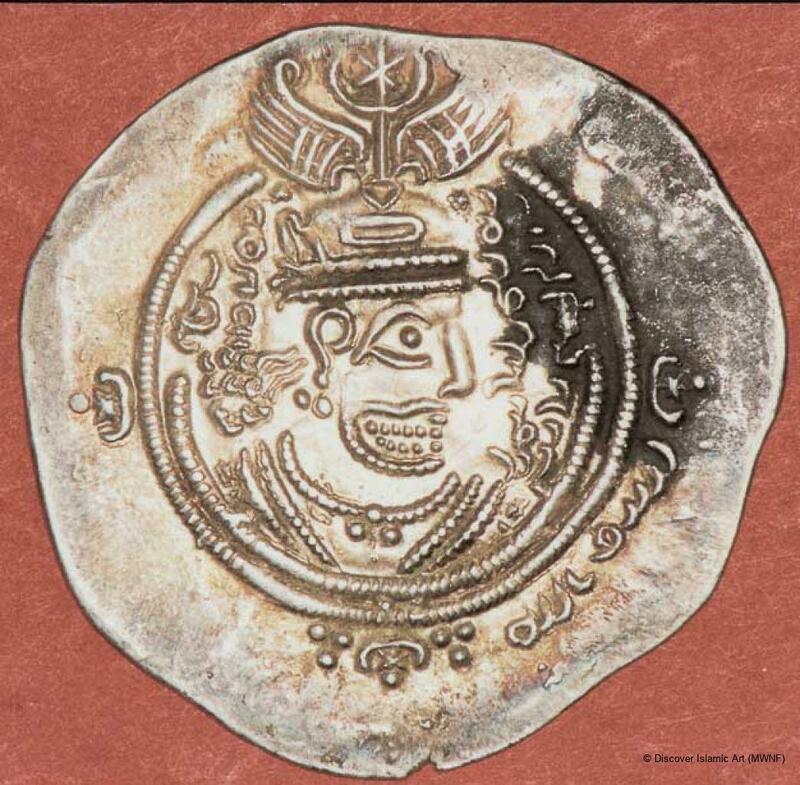 The obverse shows a bust of the Sassanid King Yazdigird III, he is bearded, with flowing curly hair bunched at the back. He faces right and wears a diademed headdress studded with two rows of pearls, which is surmounted by a crest consisting of two wide-spread wings. The name of the Caliph Abd al-Malik ibn Marwan appears and a Pahlawi invocation: 'AFZUT/GDH' ('May kingship increase'). There is an Arabic legend: 'in the name of Allah' in the margin. At the centre of the reverse the Sassanid fire altar is depicted. Elevated on three steps, the altar has two attendant priests (mobedh) who stand on either side of the altar facing it. At the bottom right is the mint, in Pahlawi: 'DA' ('Darbjird'); at the bottom left, also in Pahlawi, the date: 'shest', which in the Yazdigird calendar is the year 60. Silver dirham of the Arab-Sassanid type; the obverse has a bust of the Sassanid King Yazdigird III, the name of ‘Abd al-Malik ibn Marwan (r. AH 65–86 / AD 685–707) and an Arabic legend: ‘in the name of Allah’. The mint (Darbjird) and the date (year 60 in the Yazdigird calendar) are on the reverse. At the bottom left in Pahlawi the date: 'shest' is inscribed, which in the Yazdigird calendar is the year 60 (AH 72 / AD 692). The Yazdigird calendar began in AD 632 at the instigation of King Yazdigird III and continues after his death in AD 651. The Muslims used this calendar to date the imitation Sassanid coins they struck. The coin was purchased from an antiquities dealer in 1998. The provenance is known by the mint on the reverse of the coin, which is Darbjird in Iran (ancient Faris). العش.محمد، النقود العربية الإسلامية المحفوظة في متحف قطر الوطني, الدوحة, 1984, المجلد الأول ص 61, رقم 21, اللوحة الثانية رقم 21. Goussous, N., Umayyad Coinage of Bilad al-Sham, Amman, 1996, p.37, object no. 14.